Kvaerner Masa-Yards' Turku shipyard delivered MS Mariner of the Seas, the fifth cruise ship in the Voyager-class series of cruise ships for Royal Caribbean Cruises Ltd. The first four ships in the series. Voyager of the Seas, Explorer of the Seas, Adventure of the Seas and Navigator of the Seas have been delivered annually since autumn 1999. one ship per year. With a gross tonnage of approx. 140,000, Mariner has a passenger capacity of 3,800 and a crew capacity of 1.200. The ship measures 1.020.65 ft.
(311.1 m) by 126 ft. (38.6 m) at waterline level (161 ft (49.1 m) breadth at the bridge wings). "We are proud to have built yet another great cruise ship for Royal Caribbean, to specification, on time and to budget," said Jorma Eloranta, President and CEO of Kvaerner Masa-Yards. This Post-Panamax size has allowed for unique design features and interior solutions. The cruise ship features a four deck high horizontal promenade, the Royal Promenade, a design featured for the first time on this Voyager-class cruise ship series. The length of the promenade is some 120 m, and it has in each end an 11 deck high atrium, the Centrums. The Royal Promenade also features inside staterooms with a view. Almost 10 percent of Mariner's staterooms have bay windows overlooking the Royal Promenade. The big Savoy theatre seats 1,320 guests. Mariner of the Seas was built in a relatively short time, as production started in summer 2001, and it was docked out in February 2003. The relationship with Royal Caribbean dates back to the mid 1960's, when the cruise line's first ship, the 18,417 gt/725 passenger cruise ship Song of Norway was on the drawing boards. The yard in Helsinki built Royal Caribbean's first four ships, the Song of Norway (1970), Nordic Prince (1971) and Sun Viking (1972). The 1,400 passenger Song of America was completed in 1982. Also, the yard lengthened both Song of Norway and Nordic Prince in the first such operation ever performed on a passenger ship. The yard also developed the concepts of the RCCL third generation (Sovereign-. Monarch-, Majesty of the Seas), fourth generation (Project Vision I & II and V & VI) vessels, of which Grandeur of the Seas and Enchantment of the Seas were delivered in 1996 and 1997 respectively, and developed the concepts of the recent Vantage and Millenium class ships. 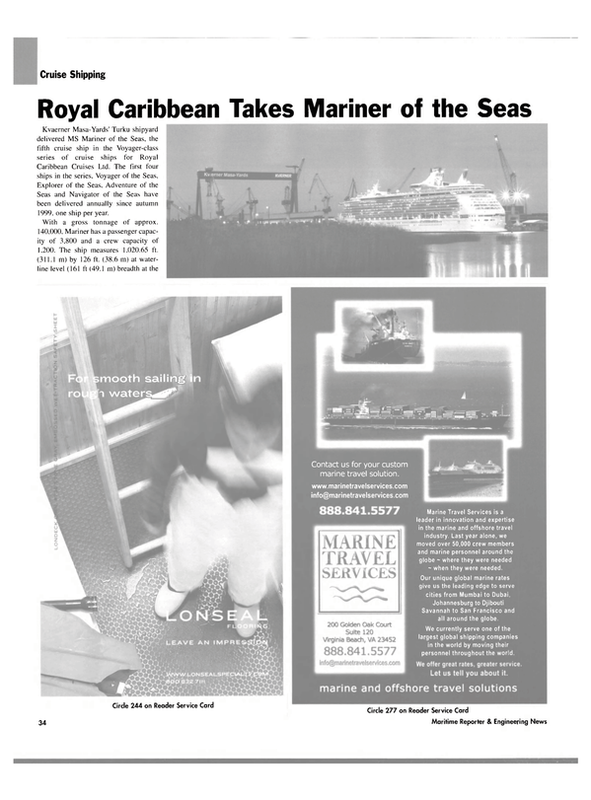 Mariner of the Seas has a very advanced power arrangement and plant redundancy to ensure that it is operated at optimum levels of safety and efficiency.